Discussions on the 2015 climate deal are in full swing at the ongoing Bonn climate talks. Countries are deeply engaged in workshops and roundtables discussing various issues that will shape the 2015 deal. 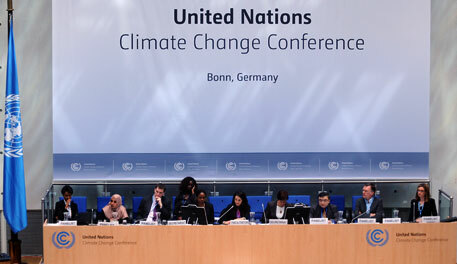 During one such workshop on April 30, the EU sprung a surprise on the issue of short-lived climate pollutants, which is fast gaining momentum here in Bonn and continues to be a bone of contention between developed and developing countries. Without mincing words, the EU made it clear that the issue of hydrofluorocarbons (HFCs) should be discussed under Montreal Protocol and that they hope a decision is taken on this in the Warsaw climate talks scheduled for November 2013. HFC is a potent greenhouse gas and among the basket of six greenhouse gases under the Kyoto Protocol. Used primarily in the refrigeration and air conditioning sectors, it has two variants—those with high global warming potential and low global warming potential. HFCs are also the third generation of manmade gases after chlorofluorocarbons (CFCs) and hydrochlorofluorocarbons (HCFCs), which are under the purview of the Montreal Protocol. The crux of the matter lies in where should HFCs be discussed—under UNFCCC since it is a greenhouse gas, or under the Montreal Protocol since it is the result of phase out of ozone depleting substances. The mandate of the Montreal Protocol, as it stands now, is to discuss only ozone depleting substances. Since 2009, developing countries such as India, China and Brazil have consistently opposed amendment to the Montreal Protocol, proposed by the developed countries to discuss HFCs under the Protocol. The reason for blocking the amendment, it is claimed, is a “principled stand”. “HFC is a non-ozone depleting substance and it cannot be discussed under the Montreal Protocol,” a developing country negotiator told Down To Earth. But the EU sees clear potential in reducing HFC emissions, which it claims can contribute to 20 per cent of global emissions by 2015 if left unchecked. “The Montreal Protocol has a proved mechanism for phasing down consumption and emission of gases in this sector and we (UNFCCC) should be the forum to encourage them to take action…under Montreal Protocol,” EU said in its statement. The developing country negotiator rejected this as a case of “unilateral thinking”. Another developing country negotiator alluded that such a step could be construed as developed countries not being interested in fulfilling their commitments on technology transfer to the developing countries. The reason for this allusion is that the technology for alternatives to HFCs with high global warming potential rests with the developed world. Under UNFCCC they would have to transfer the technology to the developing countries. Those in favour of discussing HFCs under the Montreal Protocol claim that example should be drawn from the success of the treaty in tackling ozone depleting substances, and the established mechanism of a multilateral fund which provides assistance to the developing countries to phase out such substances. They also allege that it is largely an industry-driven process and that the developing countries are trying to protect their industry by not agreeing to discuss HFCs under Montreal Protocol. Developing countries are not ready to buy the argument. They claim the developed countries are promoting their industry since they have the technology in shifting to low global warming potential HFC alternatives. With both sides equally adamant with their arguments, the impasse over the issue is only likely to continue.